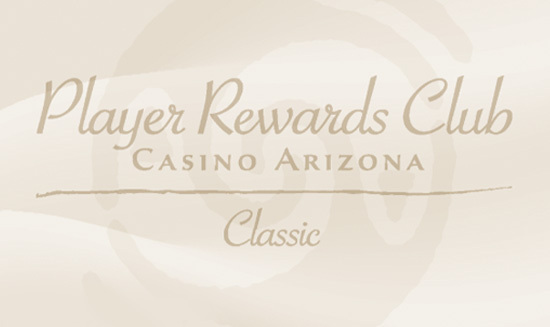 Player Rewards Club™ is the official rewards program of both Casino Arizona™ and Talking Stick Resort™. As a member, you can earn and redeem points at both locations, plus you'll receive great rewards like discounts on dining, bonus entries for gaming promotions and more. Simply use your Player Rewards Club Card every time you play table games, keno or slots to start earning points. There are many exciting options to choose from for redeeming your points. You can mix and match options any way you choose. Just like when earning points, you can redeem points at both Casino Arizona and Talking Stick Resort. Minimum cash out is $5. Table Games points can only be redeemed for gift cards, Box Office tickets, gift shop purchases or meals at our restaurants. Visit Guest Services for complete details on earning and redemption. Check your reward points balance by logging in on selected Power Perc$TM activated slot machines or by visiting a promo kiosk on the gaming floor inside of Casino Arizona or Talking Stick Resort. Rewards are free perks for members on top of your points, so you don't have to use any points to enjoy them. As you advance in tiers, you'll have access to more exciting services. We offer five member tiers—Classic, Silver, Gold, Platinum and Royal—each with customized benefits. The more you play, the more you get rewarded. 1. Online - Complete your player registration in 10 minutes or less with our online form. 2. In Person - Visit the Player Rewards Club at Talking Stick Resort (resort map) or Casino Arizona (casino map) to sign up. © 2019 Casino Arizona. All rights reserved.